Lots of parents worry about what their children eat. Why won’t they eat healthy foods? Are they getting enough? How can they convince their children to try new foods? In these households mealtimes have often become battlegrounds, nourishing no one. My Kid Eats Everything aims to change this with a handy step by step manual that uses sound nutritional principles, knowledge of physiology, and experience with sensory integration to help children learn faster and better. 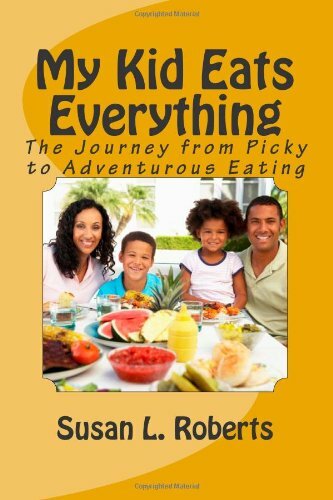 My Kid Eats Everything makes mealtimes a FUN adventure with food. Parents regain control of mealtimes and children get to feel in control of their own choices of what to put in their bodies. The book covers a variety of topics including: • Figuring out if a child has medical, social or emotional reasons for not eating – and where to go for help; • Which foods a child needs to eat to grow; • Moving from the foods a child likes to the ones that will promote healthy growth; • Making it fun for the whole family to try new foods.